Not surprisingly, the Quebe Sisters win standing ovations at just about every show. It’s been that way since 2000, when they started fiddling together as pre-teens. The sisters’ past is as colorful and eventful as their future is bright. Growing up in Burleson, a southern suburb of Fort Worth, Hulda, Sophia and Grace were ages 7, 10 and 12 in 1998 when they attended their first local fiddle competition in nearby Denton, and decided fiddling was what they wanted to do. The girls earned solo and group accolades early on, winning state and national championships in their respective age groups in 1999, 2000, 2001 and 2002. The Quebes’ evolution from the whiz-kid Western swing fiddlers they were back then to the smokin’ young adult Americana band they are today is a remarkable story, by any measure. Along with headlining their own shows to ever-growing audiences, they’ve shared stages with American music legends like Willie Nelson, George Strait, Merle Haggard, Ricky Skaggs & Kentucky Thunder, Ray Price, Connie Smith, Marty Stuart, Larry Gatlin and the Gatlin Brothers, Ray Benson, Asleep at the Wheel, Riders in the Sky and many others. 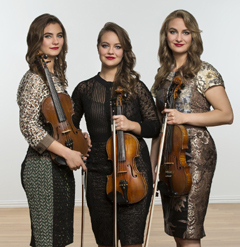 Today, after more than a decade of traveling the U.S. and the world, and recording three acclaimed albums, Grace, Sophia and Hulda Quebe are pros in a variety of genres, and count many famous musicians among their biggest boosters. The Quebes’ unbridled passion for American music, along with their talent, skills and a lot of hard work, has taken them far beyond their wildest early aspirations.